When Dorothy triumphed over the Wicked Witch of the West in L. Frank Baum's classic tale, we heard only her side of the story. But what about her arch-nemesis, the mysterious witch? Where did she come from? How did she become so wicked? And what is the true nature of evil? Gregory Maguire creates a fantasy world so rich and vivid that we will never look at Oz the same way again. Wicked is about a land where animals talk and strive to be treated like first-class citizens, Munchkinlanders seek the comfort of middle-class stability and the Tin Man becomes a victim of domestic violence. And then there is the little green-skinned girl named Elphaba, who will grow up to be the infamous Wicked Witch of the West, a smart, prickly and misunderstood creature who challenges all our preconceived notions about the nature of good and evil. 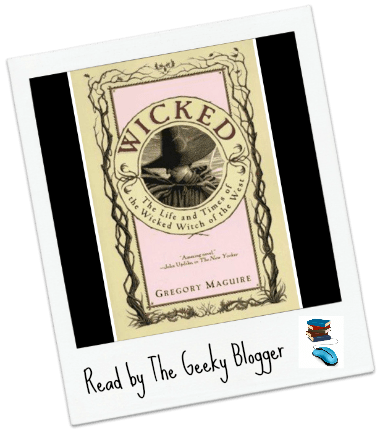 Wicked by Gregory Maguire: I was not a big fan of this book and really wanted to like it. It was however a bit to political for me. The characters were not as flushed out as I would have liked and the story drug a bit.